Standing in the long line outside Cheeses of Muswell Hill – which, incidentally, scooped the Best Shop prize at the 2016 Time Out Love London Awards this week – on Christmas Eve last year was the moment I realised just how popular Comté had become. Sure, I’d seen it on supermarket shelves and occasionally bought it from food markets, but I was still surprised when we were told that it’d all sold out. Since when did this particular French import become a British cheeseboard staple? 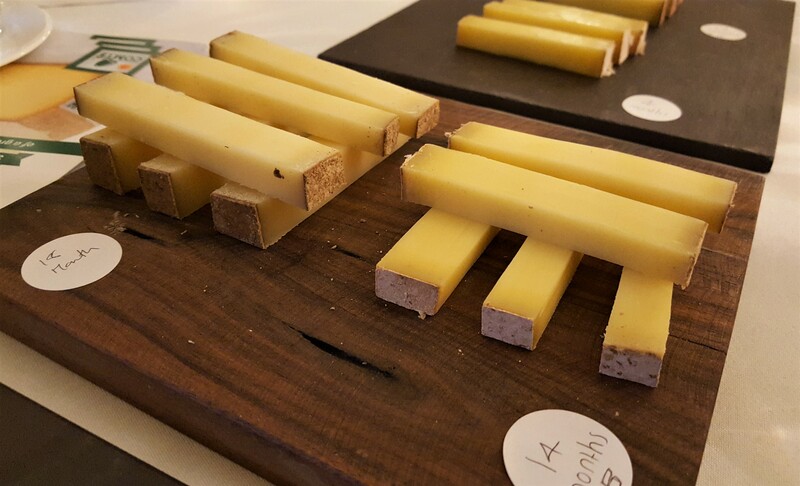 As the Brits’ love of Comté looks set to continue, French producers are keen to shine a spotlight on its origins in the Jura region in eastern France. 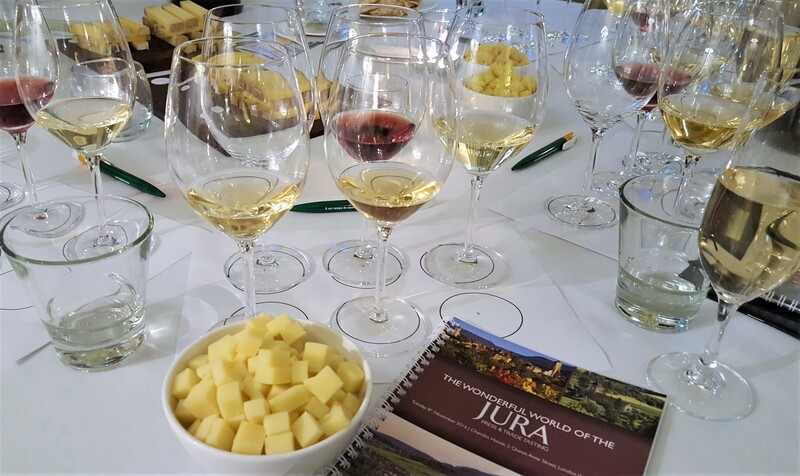 To this end, 17 passionate winemakers and farmers crossed the Channel on 8th November to showcase “The Wonderful World of the Jura”, France’s smallest winemaking region and the home of its world-renowned cheese. They were joined by the equally enthusiastic food writer and cheese expert Patrick McGuigan, wine buff Wink Lorch and biodiversity champion and author Graham Harvey. We (myself and fellow food bloggers Connie, Michelle, Alexandra, May, Vicky and Reena; links below) had all been ogling the cubed Comté piled high in bowls and the slices stacked like cheesy Jenga since we entered the tastefully decorated room in Chandos House, so were happy to get stuck into the cheese masterclass, starting with the three stages of Comté production: milk, fruitières and affinage. To be labelled as Comté, the milk must be produced by a certain breed of cow raised for this purpose: 95% Montbéliard and 5% French Simmental. The 2,700 or so family farms, which are grouped into co-operatives, aim to produce the highest quality of raw milk needed to make this distinctive cheese. 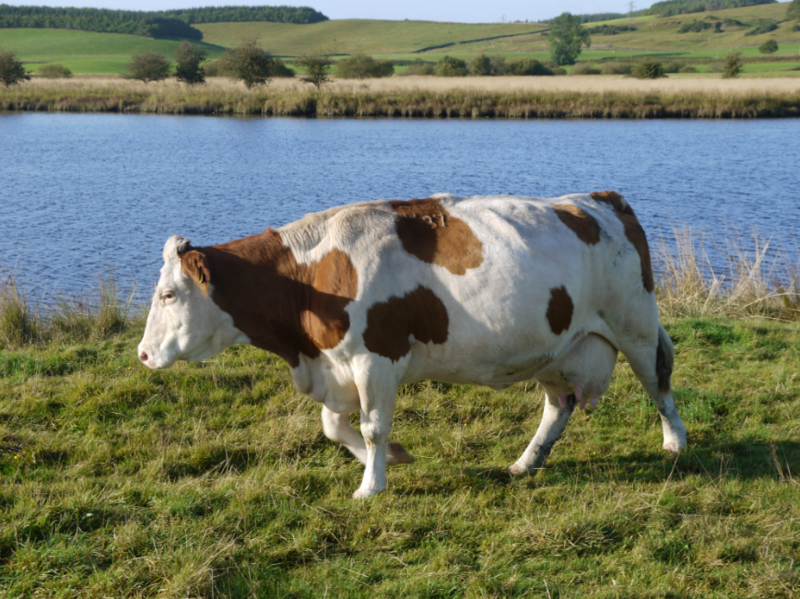 As such, their cows are only given natural feed and have at least 2.5 acres of grazing pasture. 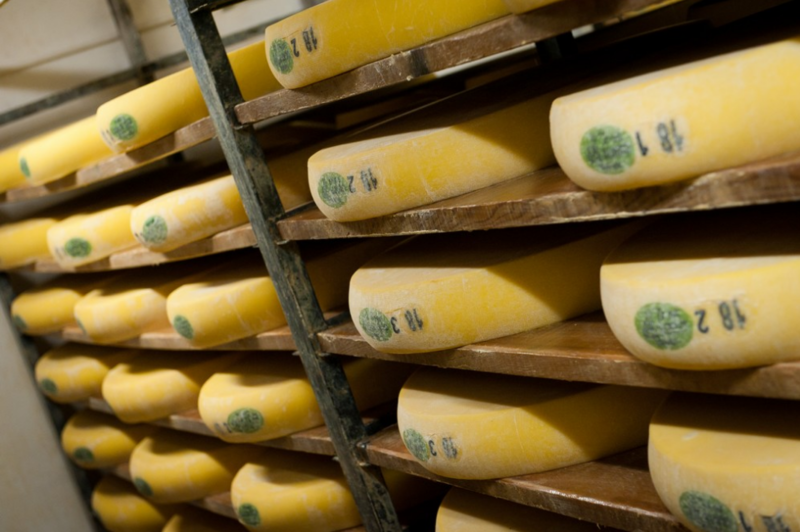 Fun fact: it takes 400 litres of milk to make one wheel of Comté, which weighs 40kg on average. 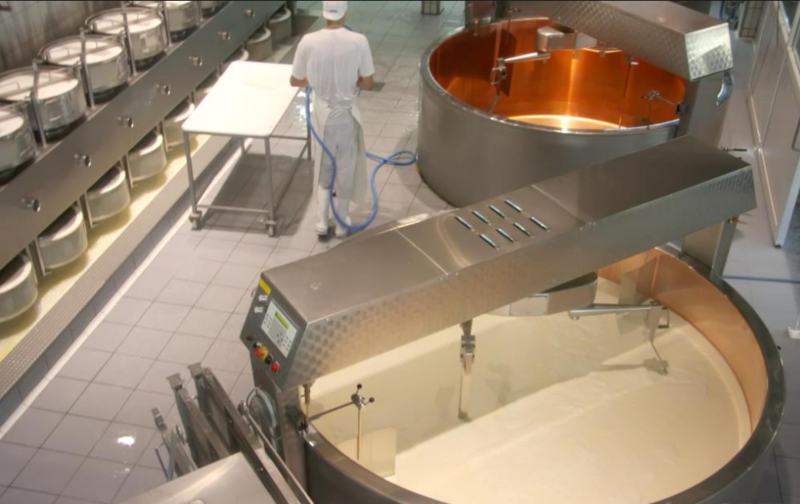 The milk is then taken to one of 160 small village fruitières, or cheese dairies, in the region to be crafted into cheese. 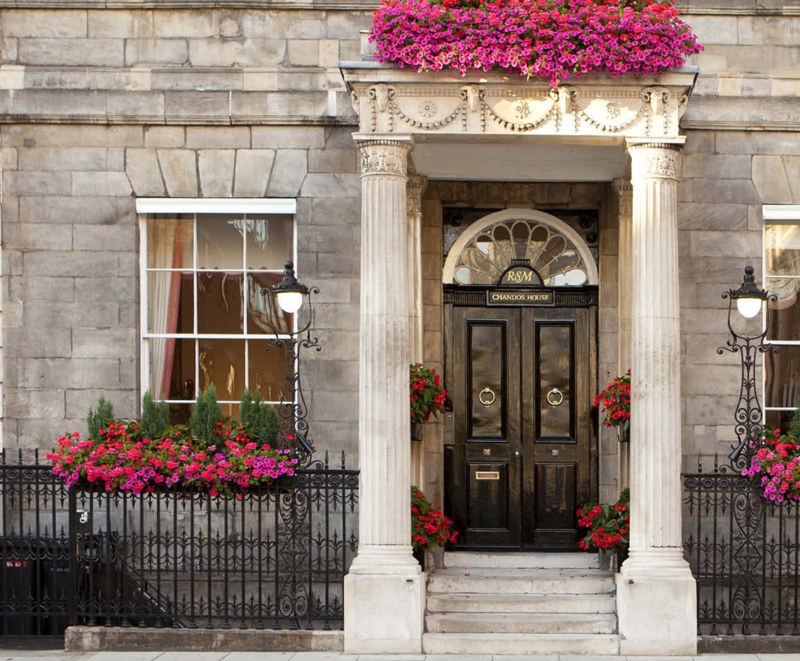 These can usually be found in the heart of the village, within an 8-mile radius from the dairy farm as per strict regulations, and are occasionally open to the public for visits. After being left to pre-ripen for a few weeks, the wheels are transferred to an affinage cellar and left to mature between four to 30 months. An affineur will oversee the ageing process, regularly turning the cheese, salting and rubbing it with a brine solution. 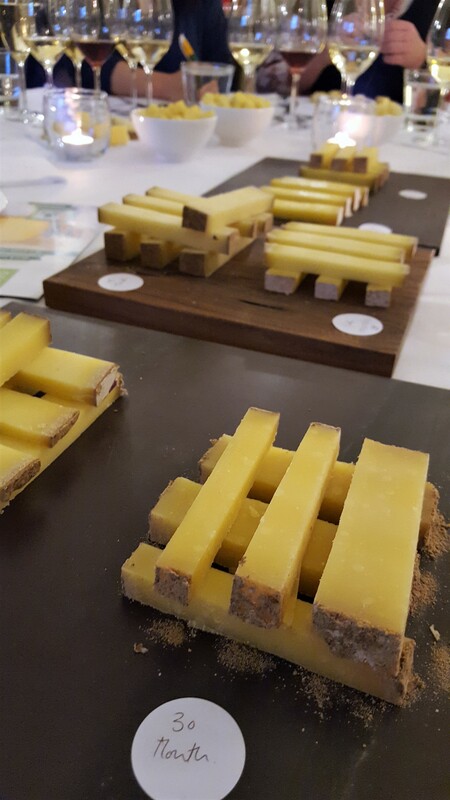 Over time, the diverse aromas which characterise Comté will slowly develop: lactic, fruity, vegetal, animal and spicy. Of course, no two wheels will taste the same as the flavour of the milk depends on variables such as the weather, flora, elevation and terroirs. Reds: Usually made as single variety wines, but can occasionally be from blends. Armed with the theory, we were poised and ready for the practical exercise. Our mission was to sample each aged cheese and match it with one of the five wines in front of us. A prize for the best pairing was up for grabs at the end. Being familiar with the flavours of the 18 month, what struck me the most was the world of difference in taste and texture between the 4 and 30 month: the former was elastic and mild, while the latter snapped easily when bent and the flavours were quite intense. That said, if I were to choose one eat on its own, it’d have to be either the 18 or 24 month as the aromas are subtle and don’t overwhelm your palate. Back to the task in hand, and it was no mean feat to find our perfect pairings, where the nuttiness of the cheese complemented the sweet notes in the wine. My personal favourite was the Côtes du Jura Les Sarres Savagnin 2014 from Vins Rikckaert with the 24-month Comté; the wine was so light, with a slightly sweet backnote that let the cheese take centre stage. I’ve long favoured red wines over white, but this one was particularly memorable for being very easy drinking. The winning match, however, was the sparkling Crémant du Jura Blanc, Domaine Désiré-Petit with the 30 month. Our table wasn’t keen on this choice, as we thought the cheese dominated the delicate wine, but this was a reminder that food and wine are highly subjective matters. 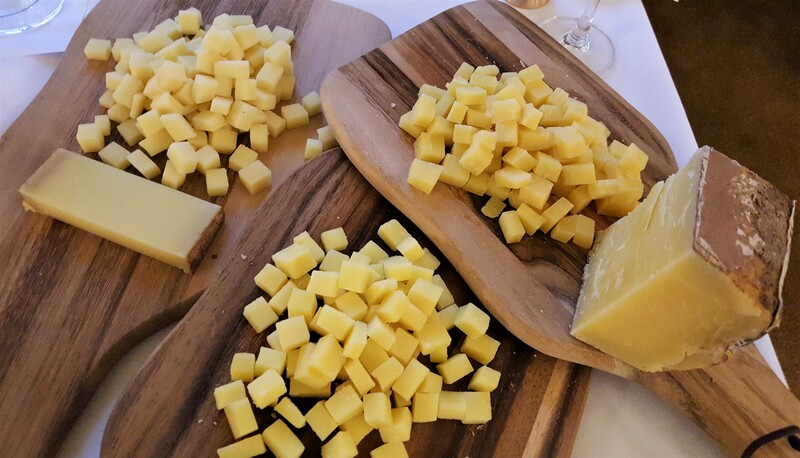 One thing we all agreed on was Comté’s versatility: it can be eaten on its own (the optimum temperature for consumption is between 15C and 18C) or incorporated into various savoury and sweet dishes like soufflés, gratins or tarte tatins. 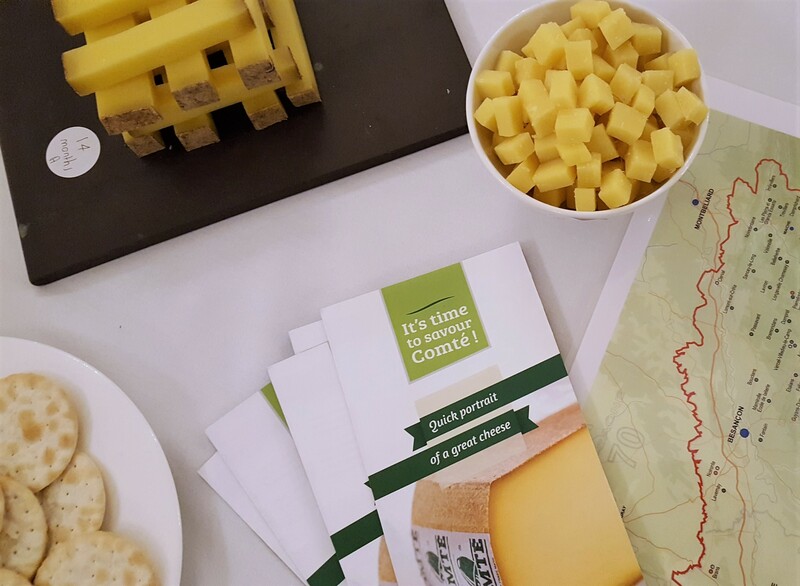 Check out the Comté Cheese UK website for some recipe inspiration for simple, everyday cooking or to leave a lasting impression when entertaining. 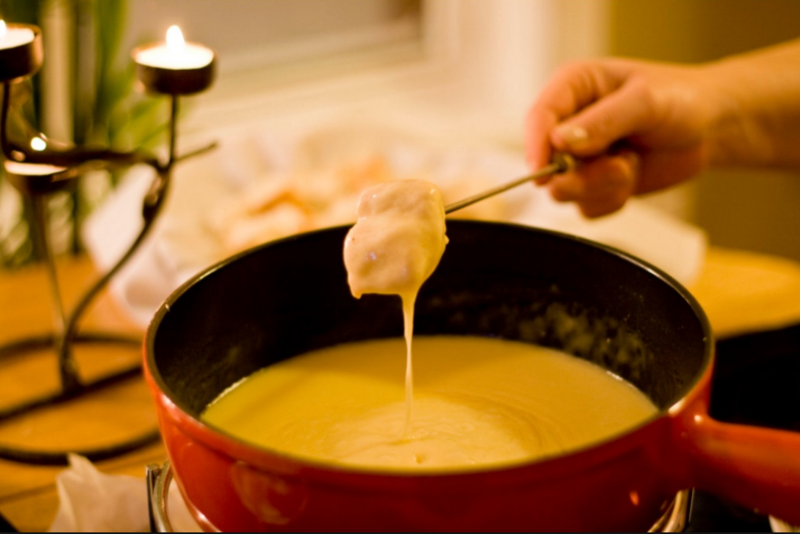 With winter on the way, I think I might try my hand at a Comté fondue to start. 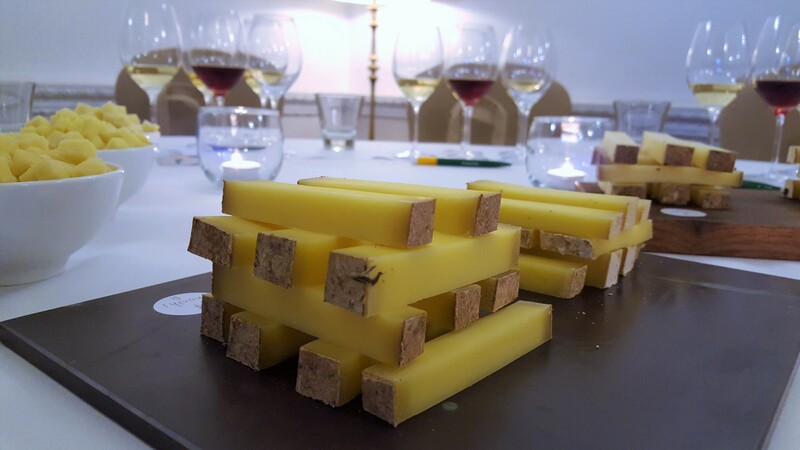 Have you made any dishes using Comté? If so, which ones and how did they turn out? 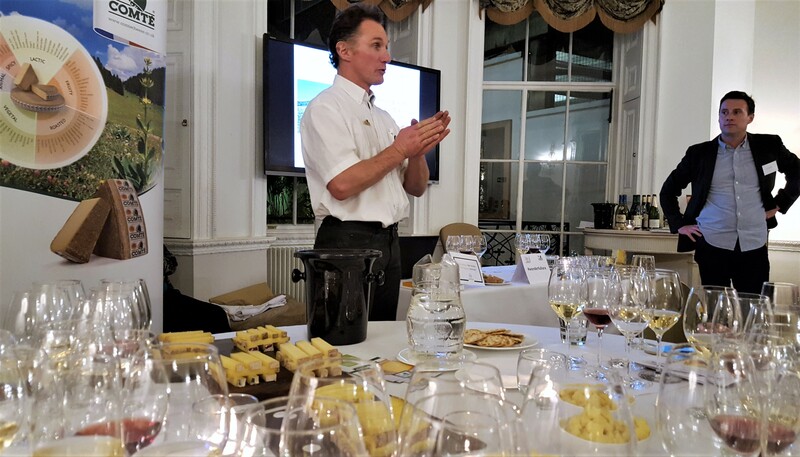 Disclaimer: I was invited as a guest of Comté Cheese UK. As always, all words and images are my own, unless otherwise stated. 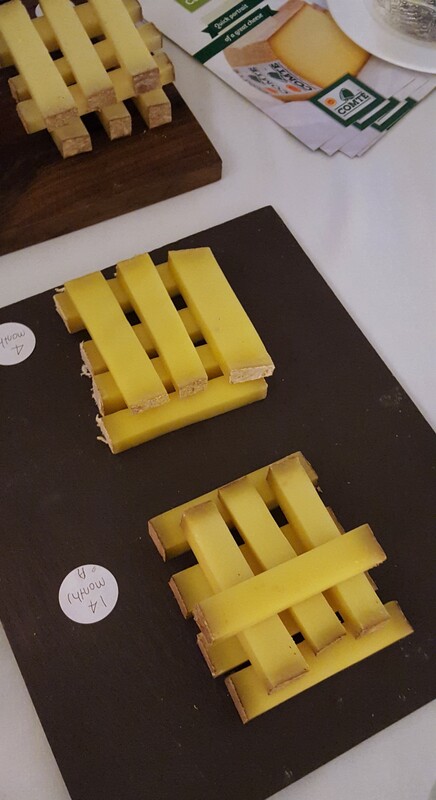 I actually left with a cheese headache that evening – it was remarkably good cheese but I definitely overdid it! Impossible to just have a few slices/cubes when the cheese is that good! Isn’t it interesting how different our palettes are? It never ceases to amaze me! He hails from Muswell Hill! From 50 or so lovely varied cheeses the Comte won !! Great party Noah and Happy Birthday once again. Thanks for your comment, Richard. Love that story, and I’m not surprised to hear that Comte was a crowd-pleaser as it’s such a wonderful, easy-eating cheese!